The Krewe series is my favorite but I did really enjoy this one. She does a great job with settings. 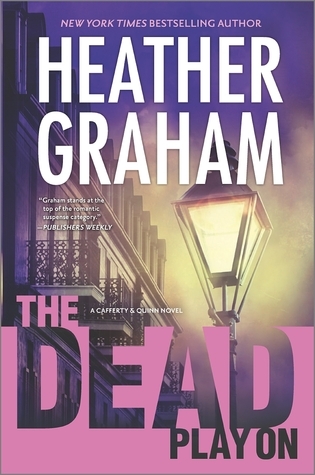 I've never read anything by Heather Graham, but she's been on my "authors to check out" list for ages. I'm glad you liked this. And there is a character named Quinn! Lol yes there is a Quinn! I have one of those author lists too. Heather Graham is one of those authors I want to just binge on but there are just do many books! I always find books with a New Orleans setting just a bit creepy, but creepy good! Glad you like the new series. New Orleans is definitely full of creepy! It's a fun city though and this book is fun too! I think Kimba just reviewed this too - combined y'all have me curious! I haven't read Heather Grahm yet, so I'm thinking about starting with the other series you mentioned. Great review! I really like the Krewe series! It's definitely easier to jump into anywhere in the series. This one is fun too and you can't beat New Orleans! I am curious about this series as I really have only read her Krewe series (and not very many of those at that). It's good to know the other is stronger, but this series definitely sounds interesting. I will have to look for this one. I like the idea of the setting. The Krewe series is more stand alone and it does appeal to me a little more. This one was creepier though! I had to read a chapter of something else before I went to bed! I've read both of the first two books in the series and find that this series is a bit creepier that the Krewe books. I like both series and have read all of them. I definitely agree that this one is creepier. I had to switch to something happier before going to bed! Even though I like the Krewe series better I'm looking forward to read the first two. Percentage wise it's likely a Krewe book! I think there are 14 or 15! She's one I'd really love to binge on but that TBR is just too massive! Try The Hexed! I think you'd like that one. The main reason the large cast is a little tricky here is because it's part of a series. It isn't too bad though. The writing was a little stiff but I didn't have trouble keeping the characters separate. Like you though I think I prefer the Krewe series. I may have been a little distracted. There was one character who shoes up at the end and I know he had been there earlier in the book but for the life of me I couldn't remember where! It didn't have anything to do with the plot but it did throw me for a minute! I love the setting and the fact that you found it was creepy enough. Too many characters can throw me too but I suppose it's easier in a series as you get familiar with so many of them. Sounds like a good read. I think keeping track of the characters if I had started at the beginning. As it was it wasn't too bad just an occasional bit of confusion.